Last week two high profile Canadian Muslim women, writer Sheema Khan and Zunera Ishaq (the woman at the centre of the niqab controversy) publically questioned the safety of Muslims here. Khan lived here in the aftermath of 9/11; she says it’s worse now. These admissions amount to a tragic statement about the use of the niqab as an election issue. Yet as Canadian women’s historians, we have heard it before. Intolerant Canadians, from political elites to ordinary citizens, have long attempted to impose their notions of what it means to be a Canadian on the bodies of immigrant women. Today’s veiled Muslim woman joins a long line of immigrant women whom this country has feared or pitied, but always stereotyped, for at least a century. 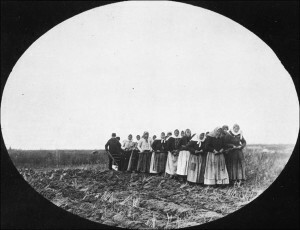 Consider those Doukhobor women harnessed to a plough, breaking the tough Prairie. Their photos, faces almost hidden by their babushkas, have graced Canadian history textbooks for decades. The widely shared image – reproduced as a postcard inviting everyone to get a look – struck many Canadians as the personification of a backward European peasant culture that treated its women like downtrodden beasts of burden. These women posed a striking contrast to the prevailing middle-class ideal of the Victorian woman – that morally superior angel in the home. Consider too the distinctive dress of the women who completed the portrait of Immigration Minister Clifford Sifton’s ideal Eastern European peasant “in a sheepskin coat” with “a stout wife and a half-dozen children” grudgingly welcomed to Canada. Someone needed to do the backbreaking labour to settle what was portrayed as an empty Prairie, the original First Nations inhabitants having been shoved aside to a number of reserves. Even Icelandic pioneer women, easily assimilated, one might expect, into the Nordic race, were castigated for their typical headdress: a dark knitted skullcap with tassel. Such women may now be considered Old Stock Canadians, but not so long ago, their Anglo neighbours viewed them as second-class. According to historian Sarah Carter, Anglo women’s organization in Alberta thought Ukrainian girls so deficient in the standards of proper womanhood that they too should be sent to residential schools. Then, too, there are the Jewish, Italian, Polish, Hungarian and other women who settled in Canada’s cities. Crowded into slum housing, these women were reduced to static folk-figures who enacted strange religious rituals and stunk up their neighbourhood with fermenting cabbage. Social workers investigated these “underworlds” and ridiculed the mamas who pushed and shoved and haggled at markets in a most unwomanly manner. Italian women, viewed by reformers as unschooled, oppressed, and shadowed by black kerchiefs, were deemed the least likely of all to adjust to Canadian life. What is it about the women-folk that make people so anxious? Women rarely run countries but they certainly symbolize the nation. Immigrant women preserve the culture of the group. They cook the food and raise the children and pass on the language. Often they dress distinctively. They stand out. Born of fear, stereotypes obscure more than they reveal. The Baba on the homestead ploughed while the men worked on the railroads or in the mines. Italian women entered the labour force in large numbers, their paycheques compensating their husbands’ seasonal unemployment. Today’s headscarfed refugee woman might be a teacher, a nurse, or a community organizer. Of course immigrant men have not always been warmly welcomed in this country. Canadian immigration history is full of examples of discrimination: the Chinese Head Tax, Sikh men forbidden to disembark in Vancouver’s harbour, Black men refused entry by a variety of barriers. The demonization of Muslims also has long roots and it has taken its own course in Canada. Yet generations of immigrant women have experienced a particular form of racism: a mix of charity and contempt. Very Canadian. In the niqab controversy we see cynical electioneering but also the remnants of some old anxieties about the nonas, babas and omas of previous generations. Just as there have always been scapegoats, susceptible to the political manipulations of the day, there has also been an audience, willing to believe the worst. Now a Canadian citizen, Ishaq has refused to let Harper speak on her behalf. This also illustrates another familiar historical pattern: immigrant women have rarely been silent in the face of discrimination. Franca Iacovetta is a professor of history at the University of Toronto. Karen Dubinsky is a professor of history and global development studies at Queen’s University. Canadian history, Does History Matter? Another example of excellent Activehistory.ca research and educating its readers about historical events in Canada which relate to current events in today’s political scene. Thanks for teaching us about the wider picture of current Canadian issues. I am quite disturbed by this article. It appears to compare two cultures which have nothing in common. Eastern European babas were and continue to be Orthodox – they share the exact beliefs (i.e. Christian) with Italian nonas. Christian women cover their heads (NOT their faces) in respect for the Theotokos/Virgin Mary; the symbolism of their head scarves relies in the humility of trying to be more like the Mother of God. Niqabs and burkas grew out of a combination of Middle Eastern beliefs (old Persian ones, for example) and Byzantine (Orthodox) ones, both of which were adopted by Muslims as they were shaping their culture in the second half of the first millennium. While the Muslims accept the indubitable existence of Mary, they dropped the divine reference of the veiling (for obvious reasons: they don’t think Jesus is the son of God) and, actually, they don’t consider their women to have more worth than a camel, rather vice versa. The Muslim veil carries a much more mundane connotation: it’s basically a symbol of male dominance over women (uncovered women may tempt men). So please, do not transform all references into arguments that suit a religion-free multicultural society. Orthodox babas/Italian nonas and Muslim women are apples and oranges, when it comes to their scarves. Oh, Amelia.. I wish I could concur. The Virgin Mary is one of the four highest revered women in Islam, holding much more meaning than the mere acceptance of her existence…and please don’t transform orientalist and misogynistic views into an argument to further disempower all women — including Muslim women who chose to wear cover themselves in a particular way. I think the article is excellent, because it does focus on the unique position women are in when it does come to the role they play in culture, religion, language and politics under the Canadian umbrella. It’s easy to lose sight of the big picture when the focus is on digging through superficial details, especially when the big picture makes us uncomfortable and challenges the views we hold. Great piece, thank you for sharing. To the commenters who assume the niqab to always in every case be a vehicle for the oppression of women, I only suggest that you actually consult some of the women themselves. Zunera Ishaq’s decisions to wear the veil and to refuse to remove it at her citizenship ceremony were in fact made AGAINST the wishes of male family members. She is an English literature teacher who has become a vocal political activist and is contemplating running for office one day. Not exactly the portrait of an oppressed, powerless person. I certainly appreciate the article in one sense…an effort to place contemporary debates about immigrants and immigration in historical context. It is certainly true that previous waves of immigrants were characterized in a negative fashion until they became (for want of a better word) mainstream. However, the comparison of two forms of dress from two radically different cultures strikes me as wrong headed. It is the sort of argument I would expect to see from a poorly written first-year paper. It is a weak argument: other women put things on their heads in the past; therefore, the niqab is the same thing. This is the wrong place to go into the reasons for the niqab as they are plentiful and varied (and yes, there is, in some interpretations, a religious injunction to wear one…it relates to modelling the moral virtues of the wives (plural) of Muhammed). To compare them to Italian widows dressing in black for the rest of their lives or East European women putting a shawl on their head (again, for very different reasons compared to the rationale for the hijab) is an effort to wilfully misrepresent Islam (or at least a portion of it) regardless of the writer’s intent. I would hope that Dr. Dubinsky had done some research into the cultural and religious history behind the niqab before making this comparison. It is a bit like comparing a hard hat to a kippah, or a turban and an Aboriginal head dress. They are all worn for very different reasons. I agree that stereotypes are often born of fear; however, I would be careful not to lump those who are opposed to the niqab (whether in a citizenship ceremony or in public) all together as simply being fearful. An interesting read in this regard is the European Human Rights Court’s recent ruling upholding the French and Belgian ban on the niqab in public .I’d also note that the Cdn. Federal Court did not rule on the Charter question of the niqab. It is still up for debate (public and legal),and it is an interesting debate. This article is about intolerance, not head coverings per se. The argument centres around conceptions of head coverings and women’s bodies. It is not the comparison of cultures, but instead a comparison of instances when Canadians were intolerant. The authors compare different examples of intolerance of women’s cultural expressions through clothing, such as the notion that Doukhobor women were backward (as opposed to Victorian women who were the mainstream ideal), or the Italian women who covered their heads in black kerchiefs, conceptualized as repressed and uneducated. In the late-nineteenth and early twentieth centuries, nationalism or notions of Canadian citizenship were often discussed around women’s bodies. Is this any different than the rhetoric we’re seeing today surrounding the niqab? Something to think about. Finally, as an editor of this website, I don’t believe that this is “sort of argument expected from a first-year paper” but rather a powerful intervention in a public debate by two of the most respected historians of Canadian history. Since there was a reply to my earlier comment, I do feel some need to follow-up. My comment that Dr. Dubinsky’s and Dr. Iacavetta’s analogy between niqabs and other head coverings being worthy of a first-year paper is valid ( and certainly debatable). First, to the editor’s comment, that the authors are intervening in a public debate as two of “the most respected historians of Canadian history” is certainly true. They are both excellent historians. However, this observation itself doesn’t validate their opinions. It is an appeal to authority. To my mind, it is far better to consider the substance of the article and deal with that directly than worry about the identity and reputation of the author. I don’t think I (or other posters who shared some of my concerns) missed the point of the article. If one reads my original posting, I acknowledge past discrimination and racism against new immigrants. However, the authors of the article clearly imply that those who don’t like the niqab are “Intolerant Canadians” who are similar to similar Canadians in the past. They are not problematizing the issue. They are making it a black and white issue. There is no grey. They make this point by comparing the niqab (not the hijab) and other shawls/head coverings women wore in the past. There are obvious contextual, historical, and religious/cultural differences between head coverings (past and present, male and female). Failing to address this is something I’ve come to expect from badly written first-year papers. I don’t think many professors would overlook a student comparing two cultural/religious practices separated by over a century of time. Further to that point, the author’s end their article by stating “This [issue] also illustrates another familiar historical pattern: immigrant women have rarely been silent in the face of discrimination.” This is very true. Have they considered the Muslim women’s associations who don’t like the niqab? They consider it discriminatory and misogynistic. If the authors had done this, perhaps I could accept that they problematized the issue. I agree with “Amy.” The article is more rhetoric than history (regardless of the use to which it is put).